This future James Bond was born in Drogheda, County Louth, Ireland, in May 1953. His father abandoned the family when Pierce was only four years old, and he was taken to London by his mother, who became a nurse. Made to feel like an outsider in English society, he initially trained as a painter and illustrator but found his true vocation, and a feeling of liberation, as an actor. In 1975, following graduation from the London Drama Centre, he became acting assistant stage manager at the Theatre Royal, York, where he made his acting debut in Wait Until Dark. Within six months, he was selected by playwright Tennessee Williams for the role of McCabe in the British première of The Red Devil Battery Sign. His performance caused a stir and he still has the telegram sent by Williams, stating only “Thank God for you, my dear boy”. In November 1977 he appeared at the Palace Theatre in the first repertory production of The Changing Room. 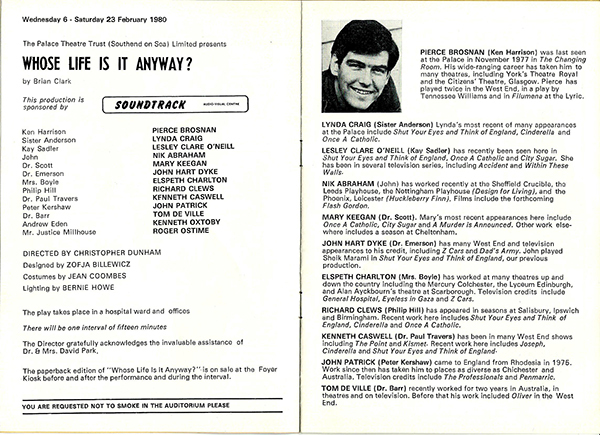 He returned in February 1980 for Whose Life Is It Anyway? Following an early film role, as an Irish assassin, in the landmark gangster thriller The Long Good Friday (1980) he found fame in the TV series Remington Steele before playing iconic secret agent James Bond in four films, beginning, in 1995, with GoldenEye. In February 1999, with the Palace facing closure, the actor took time out from his busy schedule filming The World Is Not Enough to add his support to the campaign to keep the theatre open, writing “I had many wonderful years at the Palace, and the idea of it closing breaks my heart. No community should be without its theatre, and if the community allows this to happen it will be very said in the years to come”. Happily, both the Palace and the actor have since gone from strength to strength!